Bookmarklets are very useful to perform and streamline menial tasks in any browser without regard to extensions/plugins support. They are hardly mainstream but they do get more attention in recent years and there are now handy web resources. 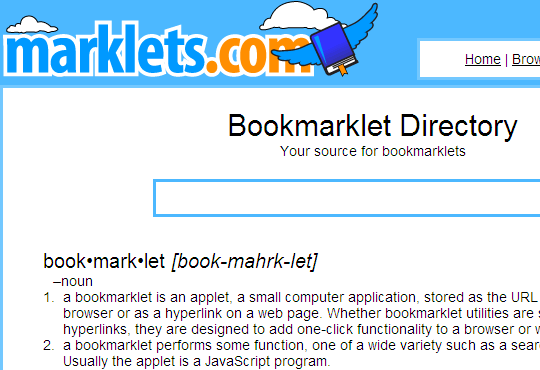 Marklets is a site with large collection of bookmarklets. Design suggests search as main method to look for bookmarklets, but you also can browse list with several sort options. Bookmarklets can be rated and visitors can sign up to leave their comments. I am not following topic closely, but so far this is largest and most comprehensive directory I had encountered. There is a lot to browse and choose from, most important thing for bookmarklets that are still scarce overall. There is also bookmarklet for site itself that creates quick search box in the corner of opened page. It could really use screenshots for more graphical bookmarklets. Ratings seem unreliable. One of bookmarklets is currently both recently submitted and high-rated, which I find unlikely. It probably just takes votes average with is poor way to handle ratings. There are tags, but no way to easily browse them or bookmarklets by category overall. Big pile of stuff with search ending up only viable navigation. Site is little hard to explore but collection is extensive and steadily growing. Most interesting is their own marklets.com bookmarklet. Searches their database and seems like that I’ll keep using it because it will allow me to remove a lot of bookmarklets from my Opera statusbar. Check it out to understand it(I’ve not explained). It is an interesting option, but I am not sure how convenient it is in the long run. Myself I prefer to keep bookmarklets as bookmarks rather than interface buttons. They are easily searchable and can be set to run on keyword in Opera. Yeah its difficult to be online when you’re preparing for IITJEE(http://en.wikipedia.org/wiki/Indian_Institute_of_Technology_Joint_Entrance_Examination), a very difficult exam. Love your blog though. Glad you like and good luck with exam!